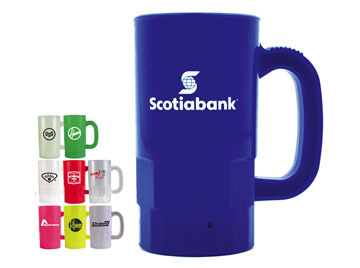 Custom Imprinted Beer Steins, Customized, Promotional, printed. (See below for additional color imprint). Full Color Digital(FCD) imprint available. Please inquire. WARNING: For Mood Beer Steins. Severe weather conditions may effect the mood change. Set-up charge: $45.00 per color per design. Re-orders $22.50. Random samples: $8.50 to cover shipping & handling (Refundable with first complete order). Rush Services: After we receive your complete order and approved artwork, 3-day production in the plant is available at 26% additional charge. • Bright, bold imprinted messages help promote team spirit for groups. • 4 Bright & vibrant colors. • Change color with ice cold liquids. 77550 Mood Beer Steins: Frosted to Orange, Frosted to Red, Frosted to Blue, Frosted to Purple, Frosted to Green. Assorted colors available. 77014 Standard Color Beer Stein: Blue, White, Red, Frosted, Granite, Neon Green, Neon Pink, Neon Yellow. 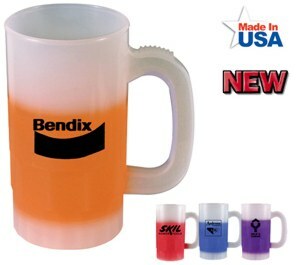 77022 Standard Color Beer Stein: Red, White, Blue, Frosted, Neon Green, Neon Pink, Neon Yellow. Black, White, Red, Light. Blue, Medium. Blue, Dark. Blue, Dark. Green, Light. Green, Medium. Green, Brown, Purple, Yellow, Teal, Orange, Maroon, Gold, or Silver. Black is recommended. Add 45.00 set-up per color, plus $0.30 per running stein. Registration will vary 1/8" in any direction making close registration impossible. Minimum order 250 pieces for multiple color imprint. Not available for item 70216. Change of copy: $35.00 per change. Change of Ink: $25.00 per change. Proofs: $12.50 each. Product proof $35.00. From receipt of complete order and approved artwork, please allow approx.13-14 working days production time in the plant on custom or imprinted merchandise, unless otherwise noted. How to order products from us. E-mail to: Customer Service , click here.